Comyns wrote female characters who speak their minds in a world which discourages them from doing that. Comyns, who died in 1992, is also the author of Our Spoons Come From Woolworths, and the protagonist in that novel is similar to Bella. 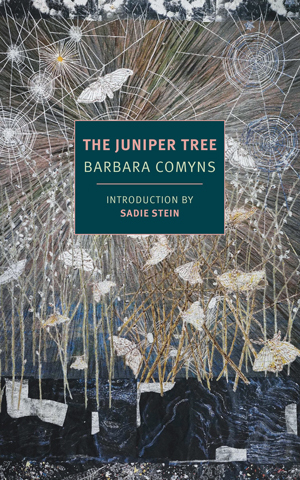 Both women see and describe the world very plainly and openly, which feels unconventional and refreshing in the opening scenes of The Juniper Tree. Comyns wrote female characters who speak their minds in a world which discourages them from doing that. What is most wonderful about the Juniper Tree’s narrator, Bella Winter, is her commitment to herself and her own personal happiness. Throughout the book, Bella frequently converses with her mother by phone. Bella’s mother wants Bella to live a more conventional life. She is extremely cruel to her, claiming that Bella should find a husband and then wondering openly what man would want her. Bella Winter is so forthright a narrator it makes the world of the story feel hyperreal. However, Bella, a buyer for an antique store with an exceptional eye for antiques and an artistic, dreamy way of thinking, never fails to put her personal feelings ahead of what society wants for her. The reader never doubts that Bella will be okay, because Bella is so set on making sure she and her daughter thrive no matter what, and Bella has the tenacity and know-how to make that happen. Bella Winter is so forthright a narrator it makes the world of the story feel hyperreal. In one passage, Bella describes her ex-boyfriend, Stephen. “So Stephen became my friend, not a trusted friend, but a friend. He used to arrive without warning, sometimes with a bottle of wine and sometimes without, but he always expected a meal.” In this scene, Stephen is closely observed to hilarious effect. Without Bella’s candor, this observation would fall flat. As The Juniper Tree goes on, Bella’s prosperous life with her daughter, Tommy, unfolds. The reader follows Bella as she falls in love with her recently widowed friend, Bernard, but balks at the idea of living with him because he might have some ownership over her. Though Bella does eventually end up living with him in his home, giving up her job at the antique store, it is refreshing to see Bella hold on to what is uniquely her about her even in the face of a man who cannot see her clearly for want of his dead wife. In Bella’s marriage to Bernard, Comyns explicitly plays with the Brothers Grimm fairy tale. In the original story, the stepmother is very cruel. Comyns pulls a kind of substitution here, as Bella is very kind to her stepson. The wicked stepmother in The Juniper Tree is actually Bella’s biological mother, and Bernard, who is indifferent—preferring to spend his time dreaming about his deceased wife over caring for his existing marriage—assumes the role of the father. In the original Brothers Grimm tale, the father is so absent at home that he does not realize that he is eating a stew made out of his own son’s body. Late in the book, Bella observes about Bernard’s son, Johnny: “He wasn’t a naturally difficult child; Bernard had made him so.” In that scene, Bernard can be seen privileging Johnny over Tommy, and it frustrates Bella. In some ways, Tommy is better off for what she has experienced; Johnny, who constantly gets his own way, is spoiled and difficult by the end of the book, much like his father. Though reflecting mid-twentieth-century tensions, many of the questions of identity in the novel feel pertinent in 2018. Prejudice against Tommy, as seen through the eyes of her mother, feel familiar to a contemporary reader. At one point in the story, Bella and Bernard hire a nursemaid to care for Tommy and Johnny. Slowly and subtly she refuses to care for Tommy. Bella has to ask Bernard to notice the nurse’s neglect of the child, as he is so wrapped up in himself. Bernard himself favors his own son over Bella’s daughter, and Johnny is painted as being privileged in this way when he and Tommy argue, as well as being white and a boy. Bernard, who lives alone in a giant house, marries Bella, who is financially solvent but not as wealthy as he is. Bernard proceeds to monitor closely what parts of the house Bella uses, and when she closes up her antique shop to care for Bernard’s estate and their children, asks Bella to keep her antiques quarantined to a tiny part of his basement. Meanwhile, possessions that belonged to Bernard’s now deceased previous wife take up large parts of his bedroom. Still, in the world of The Juniper Tree, people who have money or status and misuse it suffer over and over. Bella, committed to personal integrity, and Tommy, brought up to prize love and art and self-knowledge above all else, thrive here. Watching Bella and Tommy navigate a world so set on the accumulation of money and status with such grace is the true joy of The Juniper Tree. Allegra Armstrong is a Philadelphia-based writer and preschool teacher. She can bike very fast. She reads original poetry aloud at armstrongallegra.bandcamp.com.